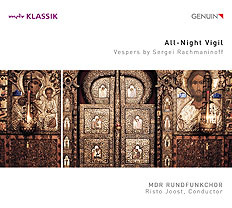 27.2.2018: The production of the "All-Night Vigil," which was released in July 2017 by GENUIN classics, receives the coveted Diapason d' Or. In the March issue of Diapason, the renowned French music magazine, the recording of Sergei Rachmaninoff's great All-Night Vigil, performed by the MDR Rundfunkchor under the direction of Risto Joost, is recognized as one of the best releases of the month. "Belle restitution harmonieuse avec une grande profondeur et de magnifiques couleurs vocales"
The Diapason d' Or (French for Golden Tuning Fork) is one of Europe's most important independent awards for recordings of classical music. It is awarded by the French magazine every month in several categories. Following the "Dinorah Varsi-Legacy" box, Michael Schäfer's "Jacques Charpentier", Paul Badura Skoda's "Beethoven: The Five Piano Concerts", and David Oistrach's and Paul Badura-Skoda's "The Last Recital", the "All-Night Vigil" is the fifth GENUIN CD to be awarded the coveted Diapason d' Or.